These are roses from a florist from a summer wedding I decided to try to clone. You probably have seen the same videos that caught my attention, ones showing how to clone roses by planting them in potatoes. I thought about those videos as I was enjoying a friend’s son’s wedding earlier this summer. The table decorations were beautiful bowls of pink and white roses. Table decorations at my friend Margaret's son's wedding in Kansas City July 2016. As I was leaving the wedding venue, I thought why not take this opportunity to see if this cloning process works. If it does, I could give a cloned rose to the bride as a wedding memento. I also suspected my friend, mother of the groom, would love to have a start. It would be an unusual but sweet memory of the lovely Kansas City weekend. I collected the same size water bottles to make little domes over the pots. 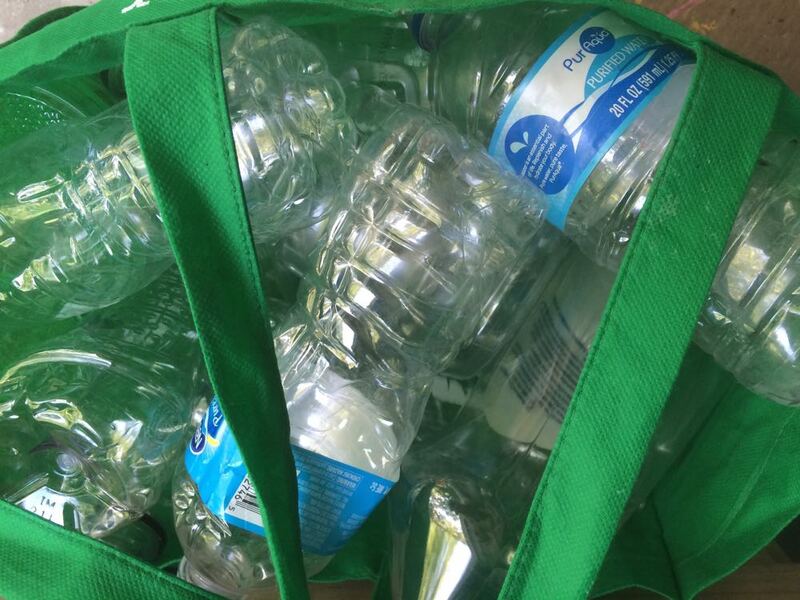 I collected a dozen clear plastic water bottles without lids. I used the same size bottles so I could monitor if there was one type of rose that did better than another one. I selected a bag of large russet potatoes to feed the rose starts. I also purchased a bag of large russet potatoes and dusted off a dozen clean plastic pots in a tray. Rooting hormone should be used separate than the original container so it's not contaminated. Rooting hormone is a staple in my gardening supplies. Best to spoon out a little into a separate container and use that supply instead of dipping straight into the container. After removing rose leaves, making clean cuts and dusting with root hormone, in they went. Adding bagged potting soil, I trimmed off rose leaves, dipped the newly-cut rose stems in rooting hormone and eased them into the potato holes before covering with soil and watering. In some cases, the rose stems were shorter than the recommended 6-8 inches. I used them anyway, making sure growing nodes were covered by soil. Potted potatoes with rose stems under their clear water bottle domes. In researching rose cloning, I discovered a glitch. Some roses offered for sale in the US are patented, which means only the person holding the patent has the right to asexually reproduce the plant. Much like videos that are copied without permission, rose breeders hold the rights to their registered roses. Cloning the rose, especially for sale, is illegal and denies the rose breeders their rights to make money. Rose patents are good for 20 years. Any rose introduced within the last 20 years are also probably patented. To stay out of trouble, it is best to only propagate rose varieties that are at least 20 years old. I don’t have a clue what the wedding roses were. They were provided by a florist, which means they may not be patented and were grown overseas. Red miniature roses bloom most of the Missouri growing season in my garden. Too bad because I still have old hybrid tea and miniature roses that bloom continuously once they start, adding a lovely scent to my garden. I also enjoy feeding them a mixture of egg shells, dried banana peels, Epsom salts and dried coffee grounds during their growing season. One of my hybrid teas is more than 30 years old. After several weeks, I couldn’t wait any longer so I peeked at the plastic bottle-covered pots. Cloned rose stems in potatoes showing signs of growth - of potatoes! Sure enough, it was working. I was growing very green, and very healthy, potatoes! Have you tried to clone - well, anything from the garden?